Meanwhile, leftist boogeymen like Joe Arpaio are speaking out against it. “They terrorized my wife,” he added. “Although, I must say the FBI agents were extraordinarily courteous” once they had taken him into custody. Stone told NewsWars the raid was "the most harrowing and chilling experience of my life." 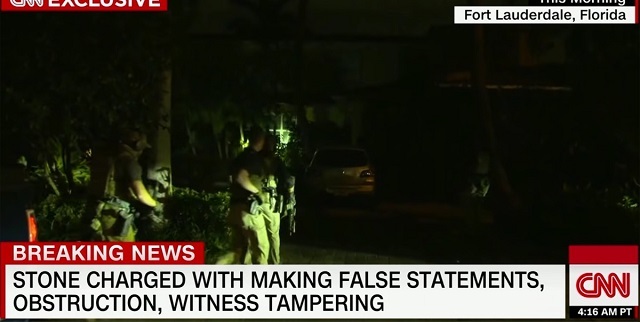 The Gateway Pundit reported Tuesday that CNN likely had footage of Roger Stone's 72-year-old hearing impaired wife being dragged out of the house barefoot in just her nightgown, but for some mysterious reason they chose not to air it. The Gateway Pundit wrote CNN for comment -- It would be completely irresponsible if they hid this from the American public. They said CNN never got back to them.